← A Week in Review! It’s been a while – and things are changing! Whew – we have been busy! Between visitors, football games and some major life changes, things in the Overholt house have been pretty chaotic. My grandparents, uncle and little brother visited us a few weeks ago. My grandparents and uncle have decided they like Wilmington (or maybe it’s Lucas they like?) so much they are moving here for part of the winter. I’m so excited for them to get to spend a lot of time with Lucas and watch him continue to grow. I know having them here on a semi-permanent basis will be so nice for him! 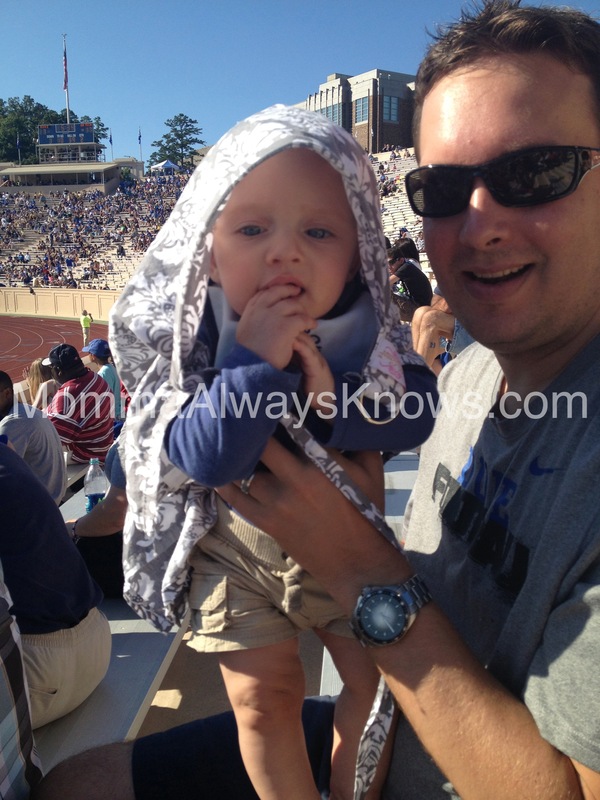 The following weekend Lucas went to this first college football game. Yes, it wasn’t a Notre Dame game, but he still really enjoyed it! 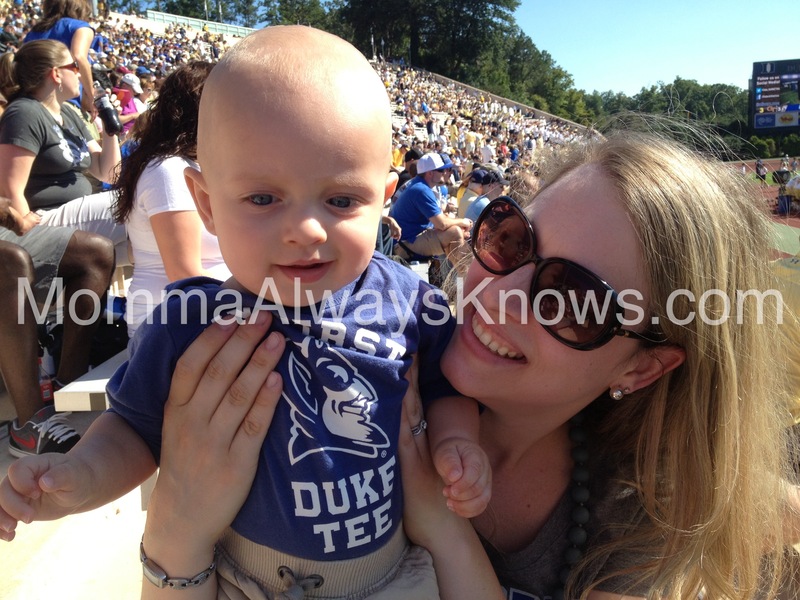 It was pretty hot and I was really impressed to find that Wallace Wade Stadium has a lactation/feeding area set up for moms and babies inside their press box building. It was nice to take Lucas into the cool air conditioned building for him to eat. I also found a great use for a nursing cover, since Mommy forgot the little man’s hat. 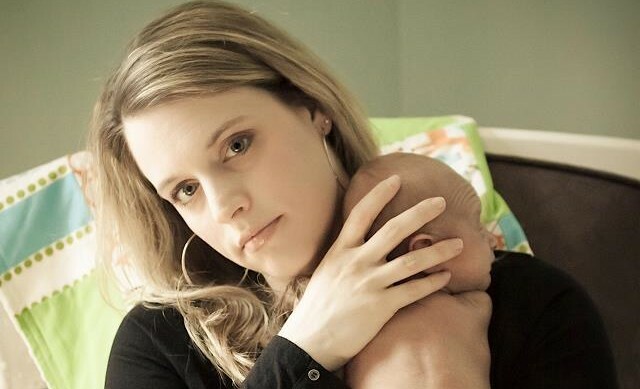 Improvising and “making it work” is certainly a major lesson I’ve learned in being a mommy. 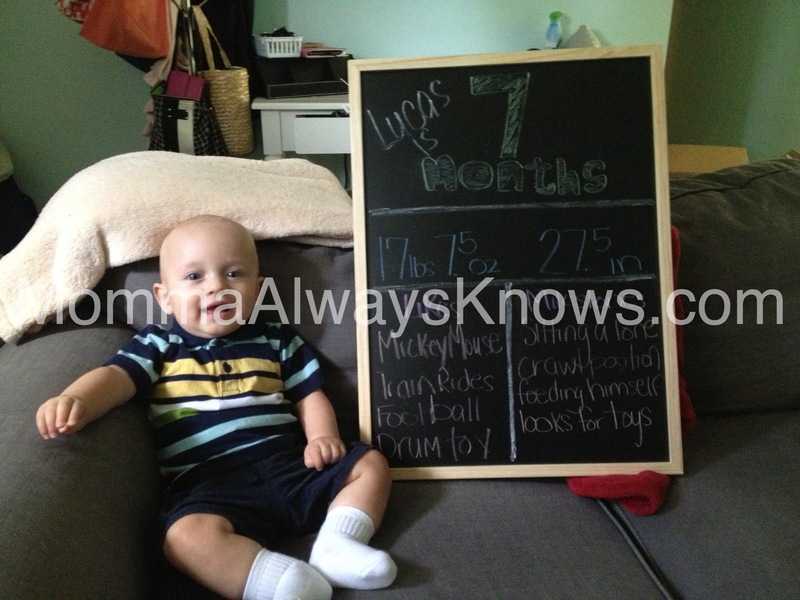 Lucas also turned 7 months! He’s looking like such a little boy now – gone are the days of him looking like a baby. He’s hitting his milestone perfectly and I’m so excited to continue watching him grow. He also had his first Kindermusik class that week! 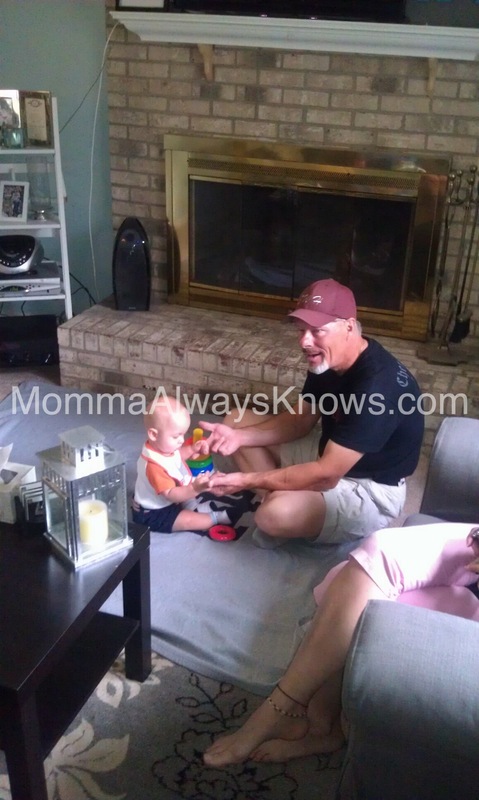 My little guy LOVES music and he REALLY loved his first class – especially because it was all about Choo Choo Trains! We wrapped up our busy few weeks with a visit from my Dad, step-mom and two of their friends! My dad hasn’t seen Lucas since he was only a few days old and I could tell he was pretty amazed how how big and smart he’s gotten. Oh, and that major life change I mentioned earlier – I can’t really talk about it yet, but check back soon for a pretty big announcement! Darrin and I are really excited to share some big news (and Lucas is pretty pumped as well!). Any guesses as to what our big announcement is? The few of your who know, don’t spoil it for everyone else! Here are my guesses: either you’re pregnant again OR it’s something related to your job … like you’re taking a different job or quitting. Can’t wait to hear!! !